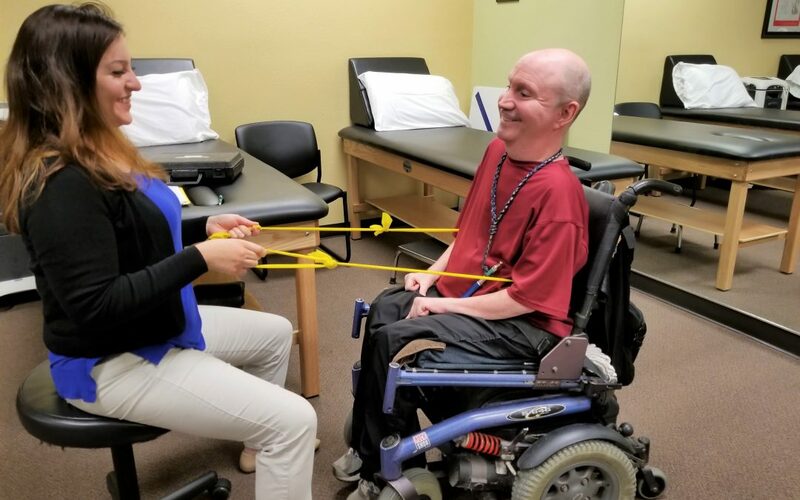 In Physical Therapy, our goal is to improve independence and return the patient back to within functional limits. 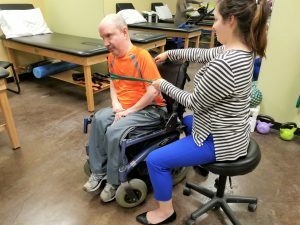 With my current patient with SMA, his goal for physical therapy is to improve his core strength and neck strength. I am the first to admit, I was a little frightened when reading about SMA. 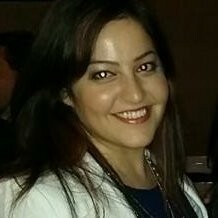 I did not know what to expect during my evaluation and how I would go about with treatments. After his evaluation, I realized he was going to be a special case for me to be creative with my treatment. At first I went straight to what they taught me in school: let’s do neuromuscular re-education — electrical stimulation to specific muscles to help his muscles activate. 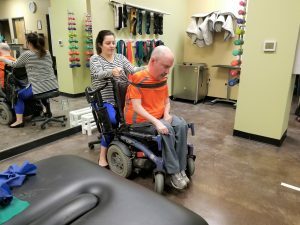 After about 12 treatments, we realized that this approach was something he can do at home because it was not showing to be very beneficial for just 10 minutes a day for different muscles. Next, we tried strengthening with isometrics and eccentric control with thera bands. First, he would sit in his chair supported, and he would side-bend as much as he could and I would add resistance for him to control the motion to upright position. We would complete the same for forward bending in his chair as well. After he got a bit strong, we added crunches with thera-bands and backwards bending with thera-bands. Additionally, we added isometric backwards, forwards, and side bending with thera-bands. 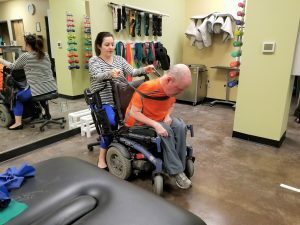 We recently started to focus on his range of motion in his neck as well as lower extremities to see if we could straighten out his contractors in his ankles, hips and knees. After about two months of passive range of motion to knees, hips, and ankles, we discussed that his core strength was declining because he was having trouble performing these at home lately. I spoke to him about possibly getting a home aid to help around the house if he needed it and to help him perform his exercises. He stated that he would call his insurance company to see if these home aids would be covered. On 3/8/18, we assessed his core strength at different levels of flexion. His core strength at 20 degrees from 90 degrees was 3-/5, at approximately 30 degrees flexion 3+/5, at approximately 40 degree flexion was 4-/5. At his strongest, on 7/12/18, he scored 3-/5 at approximately 20 degrees flexion, 4-/5 at approximately 30 degrees flexion from sitting, and 5/5 at approximately 40 degrees flexion. After 3 months of not focusing on his core, he scored back to his original manual muscle testing score. These numbers show that with physical therapy, it is important to continue progressing with physical therapy and educating the patient about their home exercise programs. It is important to have a caregiver at home to help with certain exercises that do not require skilled physical therapist on hand.